What a wonderful way to begin 2017. Your generosity supporting the NCCF Disaster Relief Fund and Chairman's Challenge inspired us. Together, we raised more than $600,000 through our Disaster Relief Fund for Hurricane Matthew recovery and surpassed the $1 million cumulative total raised through our annual Chairman's Challenge to benefit local affiliate grantmaking. Your gifts have a tremendous impact on our state and citizens. 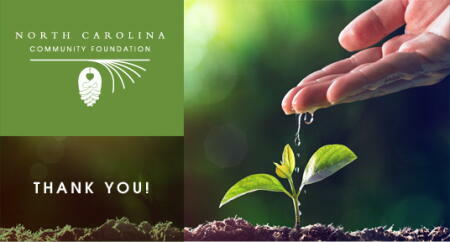 Over the coming weeks, we'll announce further details on how these funds benefit communities across North Carolina. We thank you for your gifts and continued support. Through 2017 and beyond, our State of Generosity continues to inspire.